Many Sandy victims in New York City and surrounding areas are living without power, desperately trying to keep warm. Reports from the hardest-hit areas are that folks are in need of warm garments to make it through–and making matters worse, temperatures in the area have dropped this week. It is really starting to feel like winter. Two New York-based crafty bloggers, Brett Bara from Manhattan Craft Room & Natalie Soud from A Dose of the Delightful, began to think about what they could do to help those Sandy victims without electricity, heat, or even proper shelter. They knew there had to be a way to harness the power of crafters to help–because if there’s anything knitters, crocheters and sewers are good at, it’s making warm things. 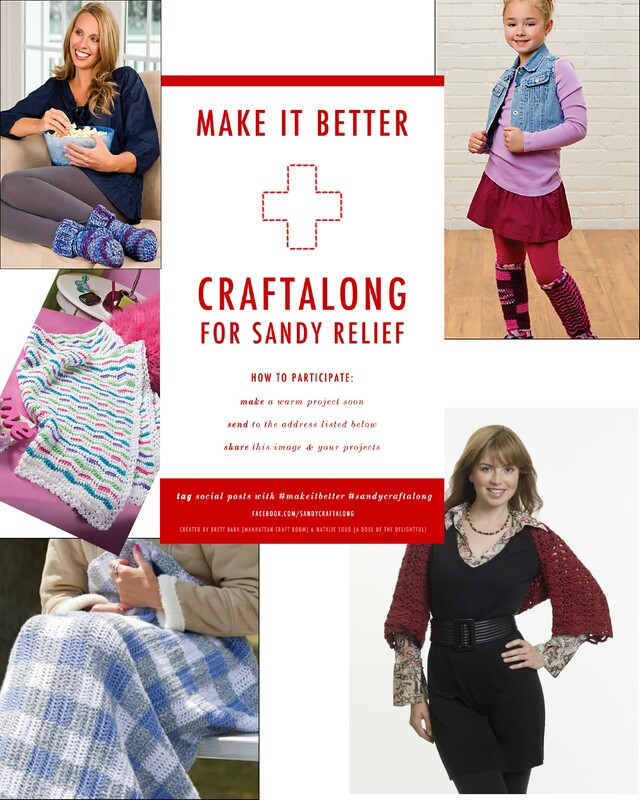 So they decided to create Make It Better: A Craftalong for Sandy Relief. The goal? 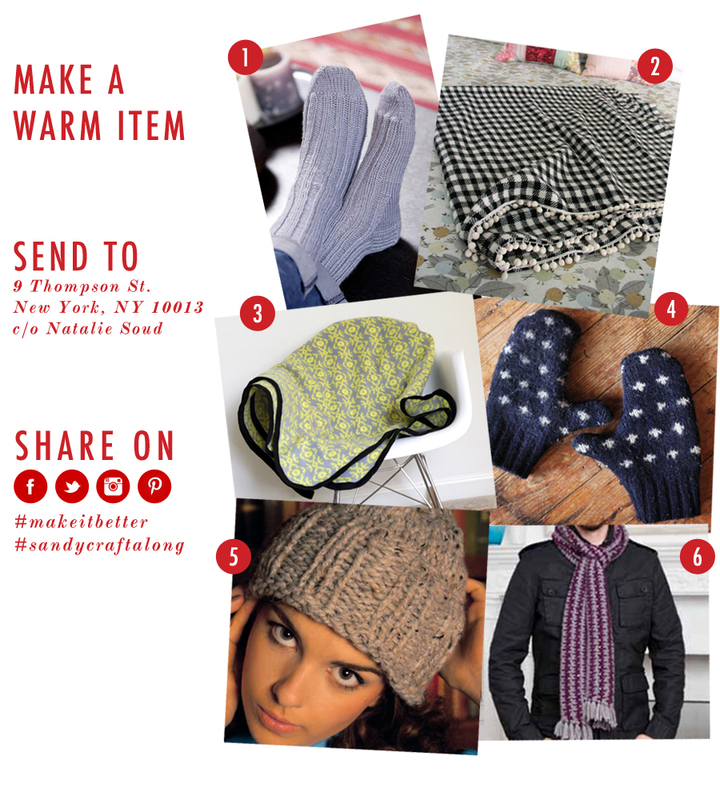 Rally crafters to make warm hats, scarves, blankets, mittens, socks and sweaters–and deliver them to people in need as soon as possible. MAKE IT. Simply knit, crochet or sew a warm garment or blanket–items most needed are hats, socks, gloves/mittens, scarves, sweaters, and blankets. Use one of the quick and easy free patterns we found below, or any pattern you like. If you’d like to include other small items to help the relief effort, feel free to donate another warm garment (new or gently used, please). We are hearing reports that general clothing is no longer needed, so please restrict your donations to warm winter items only. I’m sending my Playful Plaid Blanket (from Crochet World magazine Autumn ’12), Shades of Blue Slippers (from Crochet World Dec ’12), Color Waves Blanket (from Crochet World Feb ’12) issues of Crochet World magazine), Mismatched Legwarmers (from Crochet! Magazine Autumn ’12), & Simply Cozy Shrug from Caron International. Got them all boxed up and ready to ship out tomorrow! This entry was posted in Crochet, Uncategorized.